We’d love your help. 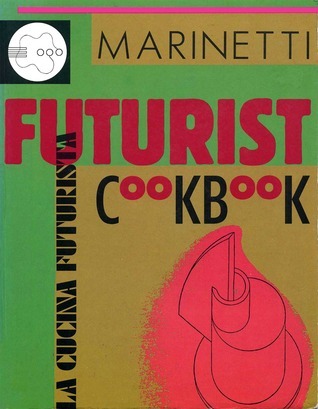 Let us know what’s wrong with this preview of Futurist Cookbook by Filippo Tommaso Marinetti. To ask other readers questions about Futurist Cookbook, please sign up. The afterword declares that this book is at least partly a joke. I'm not sure about that, but I personally find it funnier to believe that Marinetti meant every word. There's certainly something funny about futurism in general. Not the fascism, misogyny and racism, obviously, but the combination of vertiginous arrogance and child-like naivete, and the boyish enthusiasm for anything to do with aeroplanes, speed and war make for some hilarious moments. Sometimes the intellectual posturing takes cen The afterword declares that this book is at least partly a joke. I'm not sure about that, but I personally find it funnier to believe that Marinetti meant every word. Sometimes the intellectual posturing takes centre stage to the extent that the descriptions of the food, most of which are relegated to an appendix as if an afterthought, are slightly disappointing, and need to be padded with purple prose and provocative declarations in order to make them seem modern and daring, when in fact many of them are just artistically arranged plates of rice or meat with the occasional incongruous slice of fruit. For the true hostess with the most-est. Menus for all occasions merrily provided. My favorite being the Wedding Banquet featuring poisonous mushrooms. Ξεπερασμενο καλλιτεχνικο αστειο που σοβαρευει επικινδυνα σε στιγμες. Αλλα με εναν απελευθερωτικο ενθουσιασμο. Insane, absurd, dark, scary, hilarious. One of the most memorable books I've ever read. Sfida di lettura - giugno 2018. 2. L'originalità assoluta delle vivande." If you have a man dressed in tin foil misting you with a spray of oranges and basil, then you probably lived in Europe during the early 20th century with the other futurists. Marinetti's writing style lilts and tumbles including some of the most bizarre food concoctions I've ever read about. Uneven. Some parts were super fun, others were boring and repetitive. its the ONLY cook book i have actually EVER used. Delightful. Too bad the Italian Futurists were all Fascists, though. Filippo Tommaso Emilio Marinetti was an Italian ideologue, poet, editor, and founder of the Futurist movement.